The most important shot is the next one! Valle del Sol Golf Club is a beautiful 18 hole, Par 72, championship golf course. Surrounded by garden settings in Costa Rica’s Central Valley. This 6,750-yard course has excellent views of Costa Rica’s Irazu, Barva and Poas volcanoes to the north. And San Jose’s majestic mountain ranges to the west. Valle del Sol has a distinctive tropical atmosphere. Firstly, the impressive mountain views, intensely flowering gardens and the fifteen separate lakes connected by several small streams. Golf architect Tracy May cleverly designed this course taking full advantage of the natural surroundings, including small lakes and streams on most every hole. 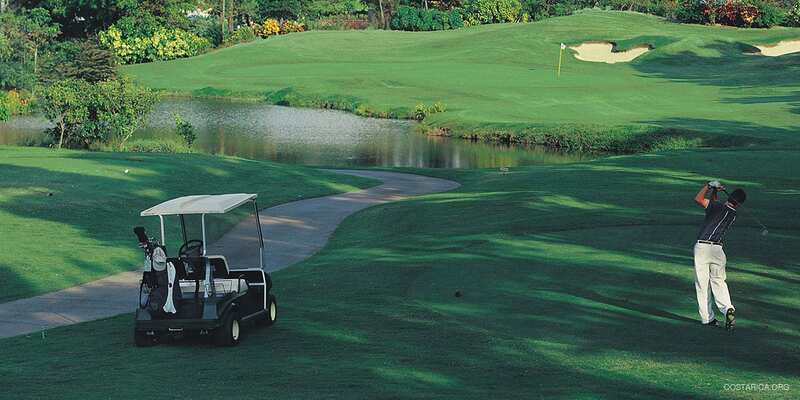 It’s nearly perfect fairways are well-groomed, separated by tropical trees, colorful gardens, and small lakes. The uniquely sculpted greens of Bermuda grass roll fast and true. Strategically placed fairway bunkers and greenside sand traps make the course an exciting challenge. With at least four individual tee positions to play on every hole, this course presents a fun and memorable experience for all those fortunate to have the opportunity to play here. An excellent paved cart path weaves around the course’s 18 holes, offering beautiful vistas at every turn, yet with its gently sloping fairways, it is a very enjoyable and easy golf course to walk. Valle del Sol has an excellent on-site driving range. Also, a professional golf instructions are also available if desired. Excellent sets of golf clubs are available for rent. The Central Valley of Costa Rica is one of the most beautiful parts of this country. There are so many sites to see and things to do. One of the most fun activities, of course, is golf but what if you or your family wanted to try something out. Then we would say the coolest thing to do is a Canopy tour of Monteverde. Or even a day tour in San Jose. Check out all the sites and sounds of the busy capital. You are sure to enjoy yourself in the Central Valley. Not only because of the sites but also the nice weather. it doesn’t get too hot here and not too cold either.